Handwritten letter in Arabic and English. The letter certifies that Tom Nassif Ajamie was born on December 28, 1892 and was baptized on February 2, 1893. The letter was signed by Rev. Gabriel Kouri on December 18, 1908. 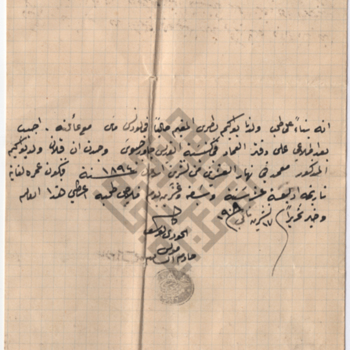 An Arabic letter handwritten by Father Khouri Nofia on October 5, 1908. It confirms the birthdate of Fadwa daughter of Fadhleh Njaimeh on August 26, 1893. A birth record, issued by the town clerk's office of Everett, Massachusetts, certifying that Dana Mansur, child of Alfred and Jennie Mansur, was born April 5, 1908. The certificate was signed by the clerk on September 30, 1922. A record from the City of Boston Registry Department certifying that [illegible] Maloof, child of William Maloof, was born June 8, 1908. The document is accompanied by an envelope. A school record created on June 9, 1922 for Julia Maloof, born June 8, 1908, residence at 40 Valley St. The record lists information about Julia's studies at the Oliver School and lists her father as William Maloof. A handwritten letter in Arabic, with attached translation. A letter, written by Father Youssef Moussa, Pastor of Damascus, on November 17, 1908. It confirms the date of baptism of Ablain Boutros, son of Bouwakim Boutros, as October 20, 1894. A letter in Arabic handwritten by Father Khouri Youhanna Al Nyaf on November 20, 1908. It confirms the baptism of Zora (last name not clear) on June 4, 1893. A handwritten letter in Arabic, with attached translation. A letter, written by Father Youssef Moussa, Pastor of Damascus, confirming the date of baptism of Ablain Boutros, son of Bouwakim Boutros, as October 20, 1894. This school record for James Arrajj lists his date of birth as October 5, 1908 and residence as 292 Oak St. It was signed by D. Callahan, principal of the Tarbox School in Lawrence on September 10, 1924. Handwritten letter in Arabic and English. The letter certifies that Tom N. Ajamie was born in Syria on December 28, 1892 and was baptized on February 2, 1893. The letter was signed by Rev. Gabriel Kouri on December 18, 1908 in Syria. An issue of al-Kown dated July 9, 1908. An issue of al-Kown dated April 23, 1908. An issue of al-Kown dated April 2, 1908.